Celebrating the life of Max Wade, Jr. "Junior"
Obituary for Max Wade, Jr. "Junior"
Max James Wade, Jr. “Junior” was born, June 17, 1932, in Tribune, Missouri, to Max and Mabel (Firestine) Wade. 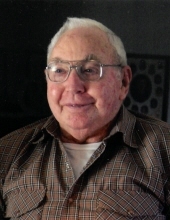 He passed away January 16, 2019, at his home in Mountain Grove, Missouri. He was 86 years, 6 months, and 30 days of age. Junior was united in marriage to Frances Eckert on July 5, 1952, in Salem, Arkansas. Six children were born to this union. Max and Frances were married for 66 years. Junior worked as a carpenter and laborer for most of his life. Later in life, he started dairying and lived on a farm in Huggins, Missouri until he retired in 1992. Besides his parents, Junior was preceded in death by one brother, Bud Wade, and one sister, Melba Sliger. He is survived by his loving wife of their home, Frances Wade, four sons, Donald Wade and his wife, Daleene, of Bucyrus, Missouri, Ronnie Wade of Mountain Grove, Missouri, Lonnie Wade and his wife, Sheila, of Cabool, Missouri, and Kenneth Wade of China, two daughters, Vivian Bowen of Columbia, Missouri, and Beth Phifer and her husband, Darwin, of Reeds Spring, Missouri, two brothers, Maurice Wade and his wife, Wilma, of Licking, Missouri, and Roy Wade and his wife, Diane, of Union, Missouri, two sisters, Peggy Ward of Springfield, Missouri, and Ruth Wheeler of House Springs, Missouri, ten grandchildren, seven great-grandchildren, and three great-great-grandchildren who will all miss him greatly. To send flowers or a remembrance gift to the family of Max Wade, Jr. "Junior", please visit our Tribute Store. "Email Address" would like to share the life celebration of Max Wade, Jr. "Junior". Click on the "link" to go to share a favorite memory or leave a condolence message for the family.